Does your back hurt from sitting at a computer all day? Or maybe your chiropractor suggested an inversion table to help you stay aligned when you are away from her office. After all, the price of those doctor’s visits add up quickly to a lot more than the cost of one of these tables. So this might be an economical choice for you to get to feeling better on a daily basis. In addition to reduced back pain and disc stress, expect reduced stress, increased blood circulation and better posture. Inversion tables counteract the force of gravity on the body to elongate the spine. Most of these products have you step onto a foot platform and brace your ankles in. You then slowly tilt yourself back until you reach the upside down adjustment where you feel comfortable. There are various reasons to use an inversion table, which we will discuss below. We suggest that you always have a buddy with you when you use your table in case you need help getting in/out, or in case of an emergency. You never know how your body will react to new things and you may need help. You also probably want to limit your upside down time to 3-5 minutes and keep it even shorter to start. What Are Inversion Table Benefits? Before using an inversion table, we suggest you consult your doctor. Try to test one out if possible, perhaps in a store where they are sold or at a friend’s house. Below is a list of the most common reasons people use inversion tables. Alex our CEO and Michelle, our COO (pictured to the right) are big fans of inversion tables and use our #1 pick in their home office regularly to take breaks and increase energy during the work day. Ironman offers many inversion tables but for this review we are going to focus on their most popular model, the Ironman Gravity 4000 Inversion Table. The patented ankle cushions are what set this table apart from the rest. These cushions make it much more comfortable to use than some of its competitors. Iron Man is our number one pick for best inversion table due to the competitive price, ankle comfort and ease of use. In fact, I even tested one out recently and felt no ankle pain at all. Here’s a deeper look at the Ironman Gravity 4000 Inversion Table (no pun intended). Roger Teeter is the inventor of the modern inversion table. He created it because he suffered from back pain and swears by its effectiveness, saying it gives him a great deal of relief compared to other methods he’s tried. The Teeter Hang Ups EP 960 Inversion Table has three pre set angles you can use via the EZ Angle Tether Strap. Without the strap you can go the full 90 degrees (hanging upside down). This is a great table and the only reason it isn’t our #1 pick is because it holds 50 pounds less than the Ironman table. Elite Fitness sells the Innova Fitness ITX9600 Heavy Duty Deluxe Inversion Therapy Table. Overall it has tons of great reviews on Amazon. 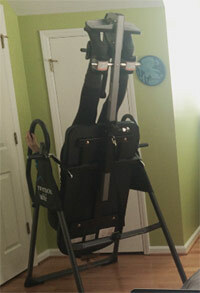 It has one of the higher capacities at 300 pounds and has 4 adjustable positions. The Body Champ IT8070 has pretty good reviews on Amazon. It’s designed to fit those with a height of 4′ 7″ to 6′ 8″ although a man who’s 6′ 7″ hit his head on the floor. So, if you’re on the taller end of that range you may not want to purchase this model. LifeGear USA went out of business but LifeGear Taiwan is still up and running. There are reported issues with their service so we’re a little unsure about the company. At this time we recommend purchasing from another company. If you have more information about Life Gear feel free to share it with us. This table is unique because you start in a sitting position and the table extends your body and rotates you at the same time. A lap belt and ankle brace are used to hold you in place. There aren’t many positive reviews out there for the Stamina inversion table so we suggest you purchase from another company. If you are tall, definitely look elsewhere. Inversion therapy has been around since 400 B.C. and even before then, yogis touted the benefits of inverted yoga poses. With every exercise/stretch/method there are different views, and the same goes for the inversion table. Some people swear by them while others think they’re a joke. Other ways you can help relieve pain in your back? Check our these massage chairs and you might also consider doing yoga moves to stretch it out. What do you think? Are these tables helpful and pain relieving or dangerous and ineffective? I am almost 58 years old and have had lower back issues for many years (on & off and getting worse with age). Do work for my back pain? My friends were recommending I get one of these to help with my back pain since they have one and swear by it! I was thinking I’d try to convince our office to get one that way I can use it at work whenever I need to take a break, relief some stress and get the benefits from inversions with out having to buy one or store it in my home!